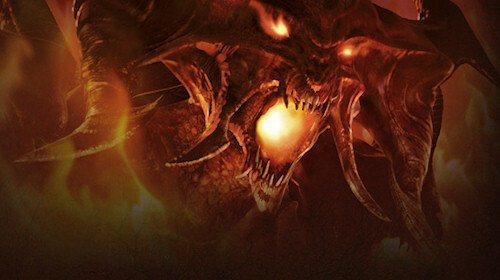 New site will be the hub for everything Diablo 3 related. Blizzard has launched a community site for Diablo 3, a website touted as your "sanctuary for all the latest developments" with the game. Blizzard is already promising in depth game guides, creature and enemy info as well as character info. The site is also linked to Battle.net - which most likely means it'll be the home for all your Diablo 3 stats and information. The gaming press (but not us) recently got hands on time with the beta of the game, making it likely we'll be seeing the beta ourselves in a short while. Polish also means that Blizzard is smoothing out the flow of gameplay, and one new choice that they've made is that players will no longer have to return to town to sell items. Early in the game, you'll get a "Cauldron of Jordan" that sits in a permanent inventory slot and will pay out vendor price for anything you don't want. There's also a "Nephalim Cube" that will grind unwanted items into the game's raw crafting materials, so any time you need to clear your inventory you can do it right where you stand, instantly. At its core, the Diablo III beta feels like the click and kill experience that made the previous games so immediately gratifying more than a decade ago. Diablo III's early acts feel atmospherically in tune with the previous entries, filled with runs through undead spewing graveyards, infested cathedrals and dark caves overflowing with creepy crawlies. Already, it feels infinitely replayable, thanks to the now standard stuff—randomly dropping loot, randomized dungeons and a strong cooperative multiplayer experience. Here's some footage ripped from the beta. Finally it's time for the controversial section of this news post. Along with these announcements Blizzard also announced an Auction House for Diablo 3 that would utilize real currency. This means players would be buying and selling in game items for real cash. Money earned in the auction house can then be used to buy things on Blizzard's store or even withdrawn to a bank account. Along with this Blizzard confirmed that Diablo 3 will require an always on internet connection to play. This controversial form DRM means laptop users will need to find an internet connection if they wish to play - even in single player. As always, Diablo 3 is out...when Blizzard says it's coming out. Which at this point looks like early 2012. Page created in 0.3786 seconds.